On the 9th of December we successfully bought an oil painting by William Marlow (1740 – 1813). 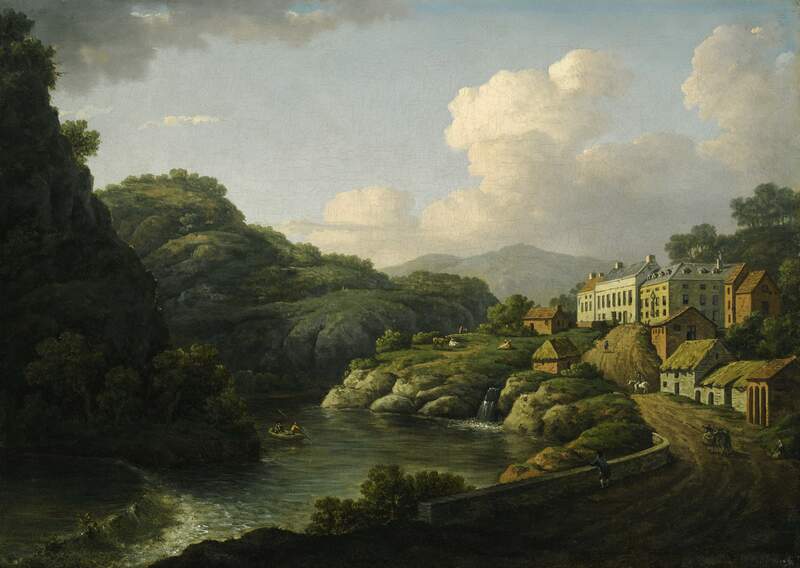 The picture dates from the 1780s and depicts Matlock Bath and the River Derwent. It shows the Old Bath Hotel which was demolished and rebuilt in 1801. It also very interestingly shows a weir in the bottom right hand corner which shows that the river was being engineered as far back as the 1780s. The painting will help interpret Matlock Bath and the northern part of the Derwent Valley World Heritage Site. It will help to tell the story of the opening up of the area; the building of roads, the coming of tourists, river engineering and the associated textile technology. Within the collection at Buxton Museum there are two engraved Marlow prints of the same scene and it is fascinating to compare these with the original oil. A lot of the detail has been lost in the engraving and figures and animals are missing. Having the original Marlow within the collection adds resonance to these prints and to the others we have of the area – including the 1805 John Bluck prints that we recently bought at the Chatsworth Auction. Before I started on this project the word acquisition mainly summed up images of people dropping things off at the Museum. Usually these were deposited at the Museum desk and the appropriate entry forms were filled in, although sometimes they were left in carrier bags on the doorstep or round the back – like a kind of charity shop donation. I have never before had the opportunity to buy at auction so working on the Enlightenment! project has been a completely new experience for me. The purchase of the William Marlow oil painting has been the first acquisition of the project that I have been heavily involved in, from start to finish. My colleagues at Derby Museum first spotted the picture in the Sotheby’s catalogue and after some discussion we decided that it would be a great potential purchase for Buxton Museum. With a guide price of £20,000 – £30,000 it was evident that we were going to need to secure some additional funding to have any hope of securing it. Bearing in mind that the auction was less than 2 weeks away we had to get the ball rolling pretty quickly. I contacted the V&A Purchase Grant Fund and the Art Fund and after getting some positive feedback we submitted our application forms. We now had to wait to see whether we were successful and whether their art experts deemed the picture to be in good condition and an appropriate purchase for us. In the meantime I went to have a look at the picture at the viewing at Sotheby’s and we had the auction house send through the condition report. The day before the auction we got the go ahead from the V&A and the Art Fund so we put in a commission bid. The next day myself and Ros kept checking the auctions progress and when lot 270 finally came up we sat there waiting…… Our suspense was soon over and what a result – we got the Marlow for the bottom end of the estimate!